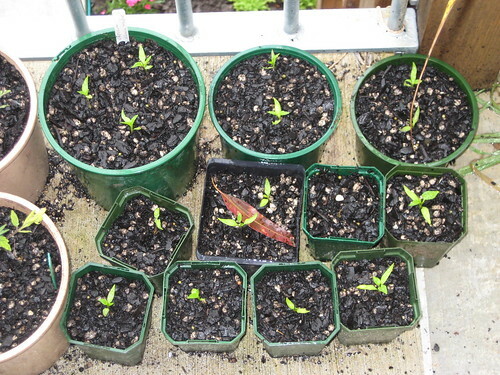 Seedlings are still popping up, the tomatoes and capsicum’s I re-potted the other day are growing nice and strong. 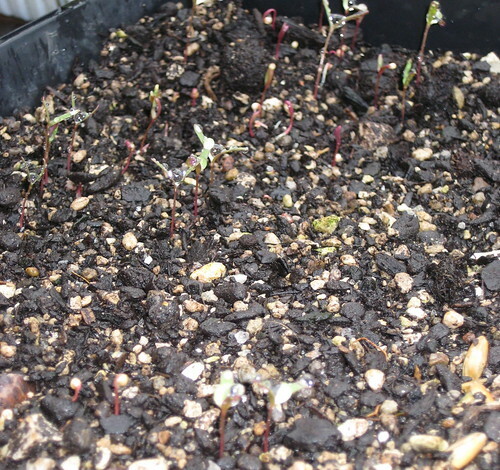 In the new batch of seedlings I have quinoa, amaranth, hulless oats, mint and basil which after the last few days of rain are starting to peak their little heads up. 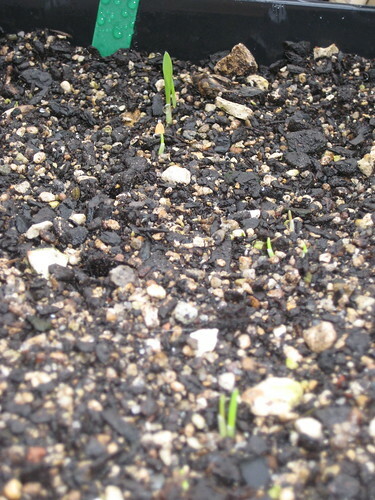 The Pink Hopi corn (which we are attempting to grow for it’s flour) haven’t as yet began to sprout. 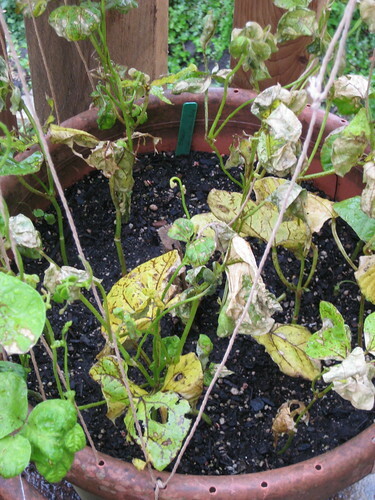 My climbing beans leaves started to wrinkle up recently and I noticed lots of little bugs, I wasn’t sure it they were too dry or if they had been infected so I decided to spray them with Garlic and Pyrethrum (an organic pesticide). I think they were perhaps a little water stressed, but I’m not sure if it was because they didn’t have enough water or if they had too much… Anyway, now that it’s rained the leaves are turning yellow, the veins are very dark so I’m not sure again why, could it be a reaction to the pesticide + water or are they coincidentally low on nitrogen? 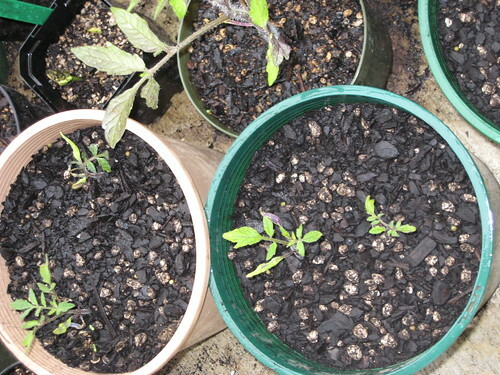 Beans usually draw up nitrogen from the soil and in pots they probably don’t get access to quite enough, I think I need to find some worm tea for them soon. 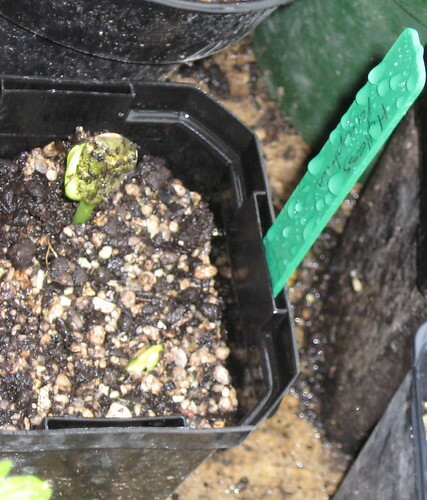 The other geeky gardening thing I’m excited about at the moment is my hulless pumpkin seeds. I just discovered 5 plants have started to pop up, considering we didn’t know if any of them would work due to the accidental early picking this is great. I planted more then three times that many seeds and a few more might also poke up their little heads but I’ll be happy if we can get these five to grow successfully.